What do you do when you hire more employees without expanding into a larger office space? Whether these new employees are full-time, part-time, or seasonal there are a few different options to maximize your office space ensuring your office does not resemble a crowded Metro bus during rush hour. Rearranging how your company utilizes space to accommodate changing numbers of employees is easy with flexible business centers. From expanding your space on a short-term basis to swapping furniture and utilizing business lounges for temporary staff, business centers provide a range of low cost or no-cost options to help your company be as productive as possible through both expansion and contraction throughout the year. When considering changing your current office set-up keep in mind how many employees you have and what their schedules are. Designing your workspace to accommodate additional staff should follow the vibe and aesthetic of your company brand. It may be important for each person to have their own executive style workstation, or it might be important to emphasize collaboration through communal tables or seating areas. Keeping spaces that reflect your company values provides continuity for staff regardless of increasing or decreasing numbers of employees. 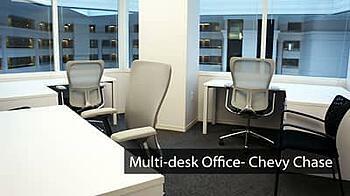 Ideally each full- time employee needs their own workstation. If all employees require their own workstation and your current office cannot accommodate staff growth, business centers are designed to quickly adjust to a client’s changing needs. Speaking with your center manager is the best way to determine what new spaces may become available long term. Part-time employees that do not overlap can share a workstation lowering the amount of desks you would need in a single space. Interns and other seasonal help can be accommodated with the addition of office furniture in a current space or by utilizing community spaces within your business center. Swapping out single workstations for communal tables with more seating is an easy way to accommodate high numbers of staff in a smaller amount of square footage. Using smaller workstations and eliminating excess cabinets provides additional workspace for more employees while making a workspace feel less cluttered. Cubicles and community spaces provide temporary options for companies to expand their office space without adding additional square footage long term. Step three: Find out how AdvantEdge can grow with you! Business centers provide flexibility for expansion and contraction with little or no additional financial commitment. Between long term spaces that may be available, community spaces that can serve as overflow workstations and a sizeable variety of traditional and nontraditional furniture options, business centers aim to accommodate client’s throughout the year to help you make the most of your office environment. 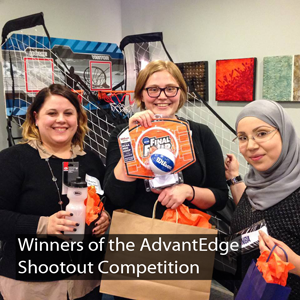 Click the link below to find out how AdvantEdge can grow with you!